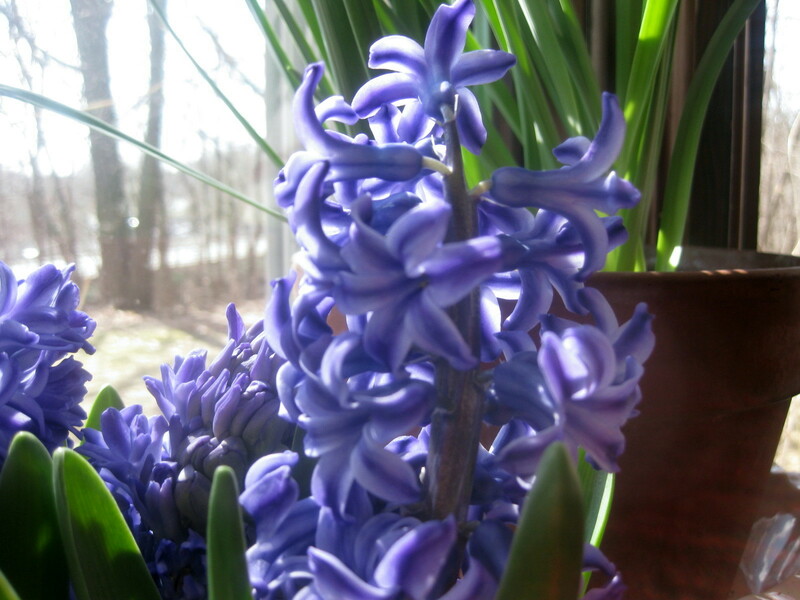 The coloring of these ‘Blue Jacket’ hyacinths is stunning when viewed up close. The petals are brushed deepest blue and edged in white. On the broad sill in my music room window, they make an attractive picture in a setting that includes zonal and scented geraniums, and still-to-bloom daffodils. What’s blooming in your window garden these days? Glad that double potting project worked for you. 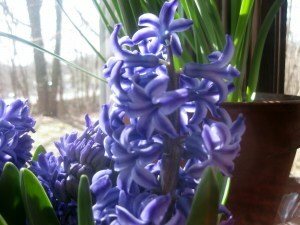 I can imagine getting drunk on the scent of hyacinths…I just love them! I almost smell that wonderful scent! I have no blooms but I do have some lettuce seeds sprouting, so I have added some spinach and broccoli seeds to the window. Still too cold and wet for planting outside. 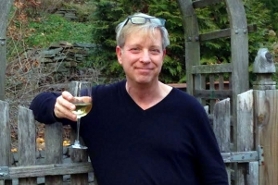 Terry – good! Now you can enjoy these hyacinths almost as much as I do! 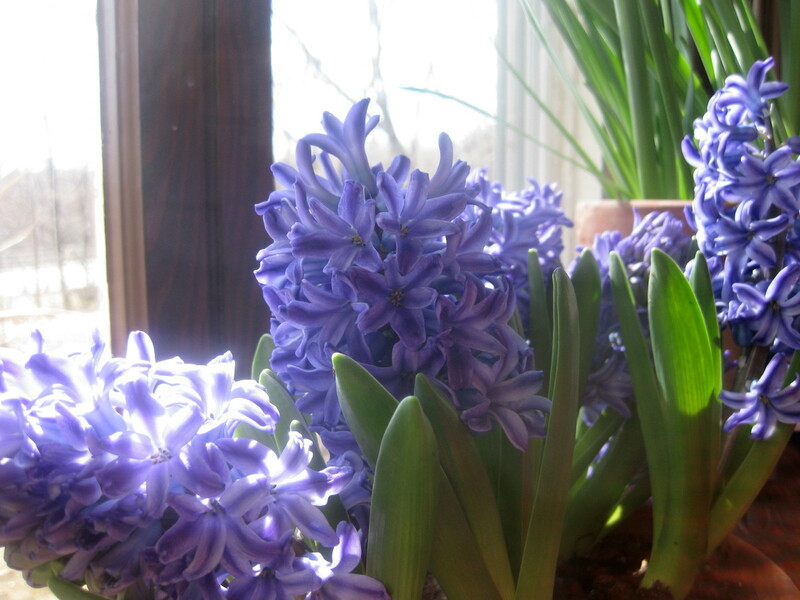 Nothing to me says Spring and Easter like the scent of hyacinths! I love it. 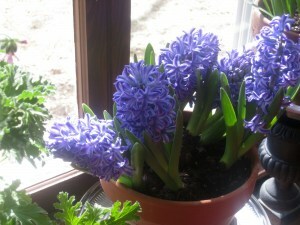 I was adding hyacinths to my wish list and having to make a decision on the color I wanted. I was leaning toward the blue delph(? )but seeing your variety, I like that better. Used to have a formal evening gown that color and it looked so beautiful on me..so I'm leaning toward that. Last year after Easter, I was working up at the church and the potted plants that were left, we were told we could take and I bought home some white hyacinths and planted them in the garden and by golly, they are blooming now, so I'll be looking for more this coming Easter! If I hadn't taken them, they were going into the compost bin. I can say I saved them and beautified my gardens too. Anonymous – what a wonderful story! Hyacinths are always worth rescuing!